The banking regulator has cut the benchmark interest rate to 12.5 percent from 14 percent, saying inflation and risks to the ruble have subsided while economic growth is suffering. The 150 basis point cut marks the third reduction in interest rates this year as the regulator said there are “persistent risks of considerable” economic cooling. 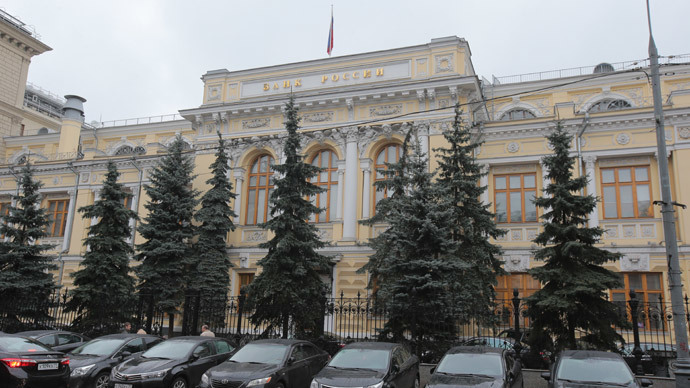 "Amid ruble appreciation and significant contraction in consumer demand in February-April 2015, monthly consumer price growth declines and annual inflation tends to stabilise,"the Central Bank of Russia (CBR)saidin the statement Thursday. The new rate comes into effect May 5, and the bank signaled it isn't done slashing. "As inflation risks abate further, the Bank of Russia will be ready to continue cutting the key rate," the statement said. The ruble lost 1.2 percent against the dollar by 2:10pm Moscow, just 40 minutes after the announcment. The reaction wasn’t extreme because the ruble had been trading lower all morning in anticipation of the cut. Bank Governor Elvira Nabiullina has already cut the interest rate twice in 2015, by one percentage point in March and by two percentage points in January. Both have been efforts to backtrack on the 6.5 percent increase to 17 percent on December 16, which was done in an attempt to put a plug on the hemorrhaging ruble. The ruble has responded well to the interest rate reductions, and in 2015 has gained more than 15 percent, making it the best performing currency this year. The rally is in part thanks to higher oil prices – Brent is over $65 per barrel- as well as a less turbulent situation in neighboring Ukraine and more attractive Russian bonds. On Thursday, one US dollar only bought 51 rubles, compared to December’s plunge when the greenback bought over 70 rubles. The Central Bank has indicated that the ruble has gained enough, and is taking active steps such as tinkering with the REPO rate to keep it stable. Higher interest rates make it more expensive for businesses to take out loans, which can stymie economic growth. Lower lending rates could in theory further spike inflation, which reached 16.9 percent in March. The Bank has to perform a balancing act between keeping the ruble strong and inflation low. The Bank hopes to quell inflation to less than 8 percent by April of 2016, and four percent in 2017. GDP in Russia is forecast to contract in 2015 after only expanding 0.6 percent in 2014. The Economy Ministry forecasts a 2.8 percent decline, whereas the Central Bank sees a worst case scenario of a loss of four percent. The next Central Bank meeting will be held on June 15.